Alzheimer’s disease, or more commonly referred to as just Alzheimer’s is a chronic neurodegenerative disease that affects memory as well as general cognitive ability. Alzheimer’s is currently responsible for over 60% of all cases of dementia, and there is no cure. Typically Alzheimer’s will start slowly, effecting short term memory at first. As the disease worsens people with Alzheimer’s can develop mood swings, disorientation, behavioral problems, and can even lose the ability to speak properly. Once Alzheimer’s begins to reach it’s final stages, people living with the disease begin to lose their basic body functions, which ultimately results in death. Alzheimer’s is fatal in most cases, the life expectancy of someone diagnosed with the disease is 3-9 years. The cause of Alzheimer’s is not fully understood, while some cases can be linked to genetics; others seem to have gotten the ailment out of nowhere. Some have hypothesized that a few of the factors leading to the acquisition of the disease could be head injuries, depression and hypertension (high blood pressure). While more research needs to be done on the subject, regularly exercising both physically and mentally can help reduce your risk of getting the disease. There are currently no medications that can reduce your risk of getting Alzheimer’s. Debatably, the buildup of amyloid plaque on the brain is one of the major factors in the degeneration of brain function in Alzheimer’s patients. A study published in 2014 in the Journal of Alzheimer’s Disease, suggests that THC has potential for treating the disease. The study showed that THC can increase the function of mitochandria which in turn helps with brain function. It also went to demonstrate that low dosages of THC were very effective at decreasing the production of amyloid plaque buildup. “Decreased levels of amyloid beta means less aggregation, which may protect against the progression of Alzheimer’s disease,” said the lead researcher Chuanhai Cao. A previous study in 2008 also noted that THC seemed to be more effective at reducing amyloid plaque aggregation than current prescription Alzheimer’s medications such as donepezil and tacrine. Another aspect in which cannabis can help Alzheimer’s patients is by reducing inflammation. Brain inflammation is a common symptom in Alzheimer’s and if left unchecked can damage neurons in the brain. By activating the CB2 receptors of the endocannabinoid system in the brain, ingesting cannabis can effectively reduce neuroinflammation. In addition to this, cannabis has been shown to help with other symptoms causes by Alzheimer’s. From appetite stimulation and helping regulate motor function to agitation reduction, marijuana seems to do the trick. 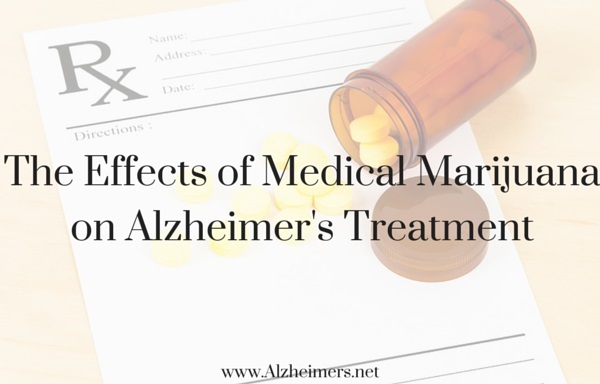 By working on multiple levels and having multiple functions when it comes to treating Alzheimer’s, medical cannabis seems to be a good remedy for preventing further damage by the disease. At the moment more research still needs to be done on the effects marijuana can have on Alzheimer’s. But for the time being it definitely seems like one of the more promising treatments for the disease. If you or someone you love is struggling with Alzheimer’s, medical marijuana can definitely be a good avenue to go down. If you live in a medical state, ask your doctor about getting a prescription!